How far away my home in France seemed today. I saw a car wipe the mirror off a parked vehicle and just keep going. On the petrol forecourt at ASDA a road rager tried to punch in the side window of a terrified old guy accused of queue jumping. I think he was just a bit confused. He made off in terror. The raging bull was about 40, nicely dressed, driving a newly registered big BMW. I sent an early death with boils and suffering ray at him. He scowled back. I’m gonna do a voodoo doll of him later just in case I missed with the hate ray. What I’m trying to say is that it all seems so angry here. It’s as if we are overcrowded rats. Of course you can’t compare a rural environment with a crowded urban horror of traffic, concrete and suspicion. Many years ago I wrote a poem when I was living in a run down environment. Check out “Angry Man In The Flats” here. Suddenly the news is filled with whips. (No black leather or high heels guys). 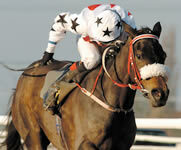 The body in charge of UK horse racing has declared that whipping (of horses) should be allowed but should be reduced. I was once at a horse race where a horse ridden by a well known jockey snapped a leg. The millionaire mega star aimed a tirade of abuse at the animal and stamped off to his helicopter. The horse was destroyed. Then came the news that a Saudi lady, Rima Al-Mukhtar is to be whipped for the offence of driving a car – a practice banned apparently not by God, but by guys with beards acting on his behalf. Now as a lady bus driver I really do feel that we need to get a grip of this kinda stuff. Why do we stand for it? Why do we allow this barbarianism to go unchallenged? Do I hear the answers OIL and DEFENCE CONTRACTS? In France there is much controversy about females wearing burquas. Several have been fined small amounts. President Sarko believes that it is about the liberty of women, although apparently some women want to look like daleks in bin liners. What I want to know is how you blow your nose when you’ve got a streaming cold, or if you sneeze? Does it just run down inside the fabric. Is there a special kind of cloth called Sneezelamé? What worries me is that there are religious guys who would like to impose this kinda show on all of us. I don’t think so comrades! The car is back! Looks like it was what Gilles told them. At least he’ll be happy and righteous. Emma thinx: Female lashes? Looks like the Ayes have it. This entry was posted in Animals, Emma Calin, English Working Class Life, poetry, road rage, Social Comment by emmacalin. Bookmark the permalink.